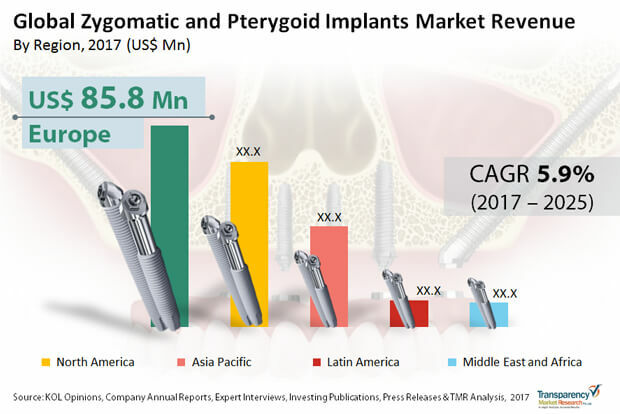 In the battle for supremacy in the global zygomatic and pterygoid implants market, most companies are seen taking the inorganic route of acquisitions. A leading player Danaher Corporation, for example, shot to the forefront after acquiring Nobel Biocare, which is a powerhouse in zygomatic and pterygoid implants. Danaher Corporation has also burgeoned with multiple products under its wing and a solid geographical presence. Yet another strategic buyout which changed the contours of the zygomatic and pterygoid implants market is that of a Brazil-headquartered implant company Neodent by Straumann Holding AG. Apart from Danaher Corporation and Straumann Holding AG, other big shot companies operating in the market are Noris Medical, Silimed, S.I.N. Implant System, Implance, Southern Implants, Jeil Medical Corporation, and Titaniumfix. The global zygomatic and pterygoid implants market is expected to tread a steady growth trajectory by clocking a CAGR of 5.9% from 2017 to 2025, predicts a report by Transparency Market Research prepared after an exhaustive primary and secondary research. The opportunity in the market is expected to become US$350.2 mn by 2025 from US$211.4 mn in 2016. Based on the length, the zygomatic and pterygoid implants can be categorized into above 50 mm, 41–50 mm, 31–40 mm, and 30 mm. The 31-40 mm segment, of them, held a leading share in 2016. Latin America, North America, Asia Pacific, Europe, and the Middle East and Africa are the dominant geographic segments in the global market for zygomatic and pterygoid implants. At present, Europe among them, leads the market with maximum share. In the next couple of years too, the region is expected to retain its dominant share by rising at a maximum CAGR of 6.2% during the period between 2017 and 2025. A good deal of pharmaceutical companies pouring money into development of better dental implants for atrophy of maxillofacial bone is the primary reason for the dominant position of the region. Our report informs that zygomatic implants succeed almost 95% of the time. Their advantages over prevalent implant procedures and greater success rate are the primarily serving to boost their market. But there are other factors too that are positively impacting the market such as a large pool of elderly highly susceptible to dental issues, alarming rise in dental injuries, more money with people to go for such dental procedures, and increasing concerns about one’s appearance. Multispecialty hospitals, equipped with surgical instruments, general anesthesia, and specialty care – all of which are needed for zygomatic implant procedure – are generating maximum demand and revenue in the global zygomatic and pterygoid implants market.